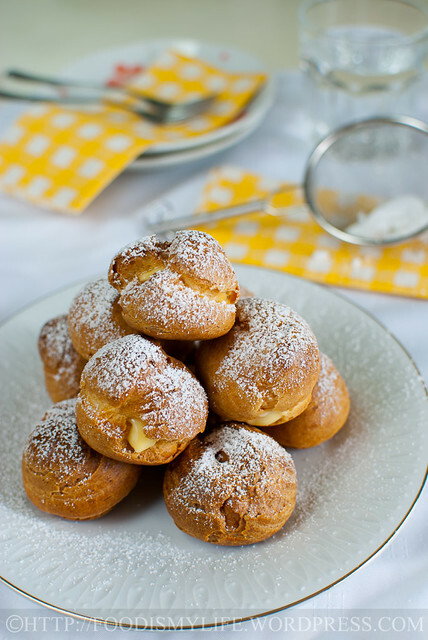 Choux à la Crème is the French name for a well-known dessert – cream puffs! Almost everyone I know love cream puffs – it’s always the first dessert to be emptied from trays during dessert buffets! 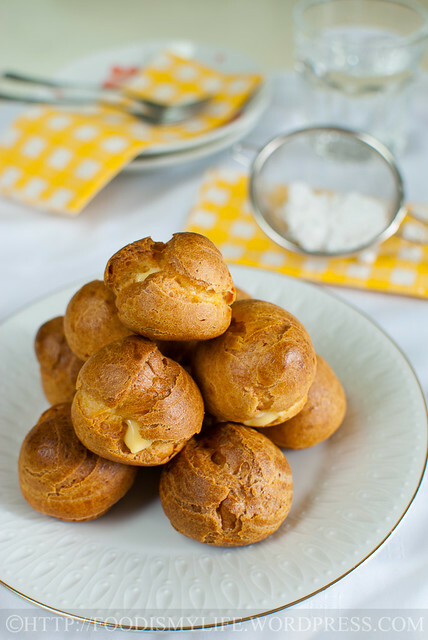 Choux pastry, aka pâte à choux, is a light pastry dough made with only four ingredients: liquid (milk or water), fat (butter), flour and eggs. It’s interesting that without any raising agent, it is able to puff up very well with a hollow interior. The rise is caused by the high moisture content (liquid and the eggs) in the choux pastry which creates steam during baking, pushing the pastry upwards and creating a hollow centre at the same time. It was said that choux pastry was invented in 1540 by Popelini, Catherine de’ Medici‘s chef (Catherine de’ Medici is the Queen consort of France from 1547 to 1559), and gradually became more popular in the 17th century. It is called pâte à choux because it looks like a cabbage – and choux is cabbage in French! Choux pastry is mostly baked, but there are fried versions as well. It is often filled with sweet fillings and sometimes savoury fillings. I finally had a chance to bake cream puffs (I’ve been procrastinating a very long time! ), thanks to these ladies: Joyce from Kitchen Flavours, Lena from Frozen Wings and Zoe from Bake for Happy Kids for deciding on cream puffs as the theme for this Bake Along. 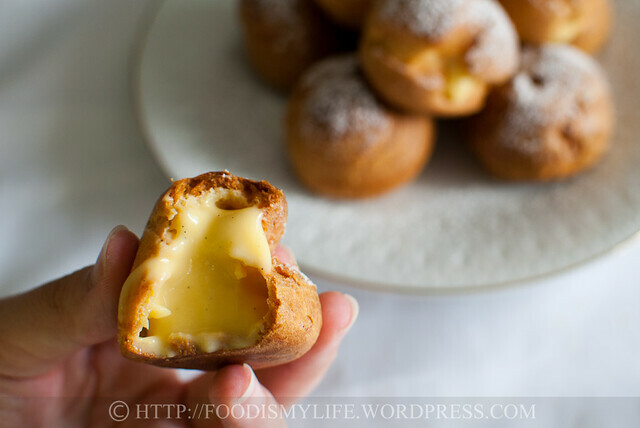 I’m sure many foodies out there are very excited as well to be baking cream puffs! 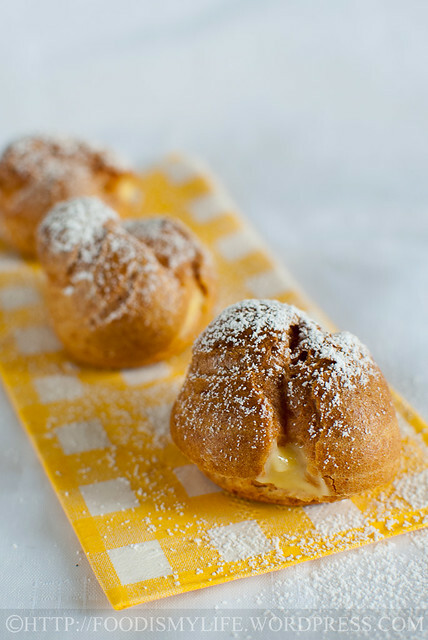 Cream puffs are surprisingly pretty easy to bake yet they can easily impress almost everyone out there! 😉 There are no magic involved in baking a good, puffy cream puff, but it’s essential to know some basic rules (they are more elaborated at the recipe below!) on making choux so that it’ll be a smooth journey while baking them. But before I go into the step-by-step photos and the detailed notes, here’s a look of the interior of the cream puff – filled with lusciously rich pastry cream. I went to heaven the moment I bit into it, and then I couldn’t resist and ate 3 more puffs after that, it’s that addictive! Combine butter, sugar and milk in a pot and bring it to a rolling boil. Add in all the flour and mix, mix, mix! Mix until you form a ball of dough and that there’s a thin layer of dough stuck to the bottom of the pot – that’s the sign that the dough is ready! Beat in the eggs, little by little to get a smooth choux. A smooth and thick choux ready to be piped! 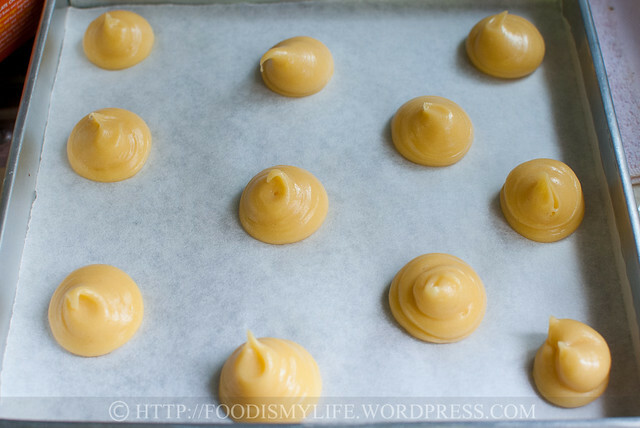 Transfer the choux into a piping bag. Pipe small mounds of choux onto a baking sheet. 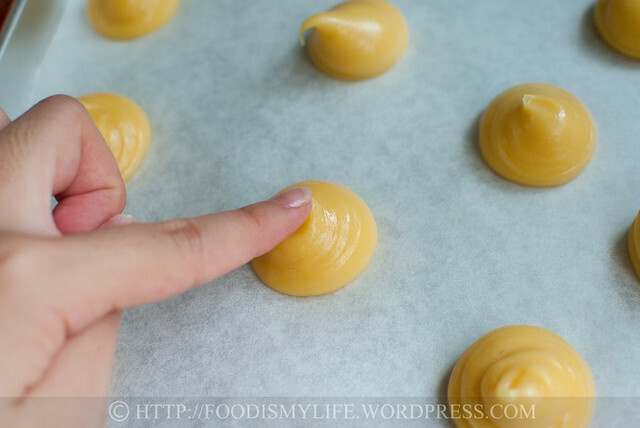 Dampen your finger and slightly flatten the choux so that the tip won’t burn during baking. Bake until they are well-puffed and the interior’s dry! Choux à la Crème – ready to be eaten! Dust with icing sugar – heavenly! I’m submitting this to Bake-Along hosted by Joyce from Kitchen Flavours, Lena from Frozen Wings and Zoe from Bake for Happy Kids. Do click the picture below to see other foodies’ bake on cream puffs! 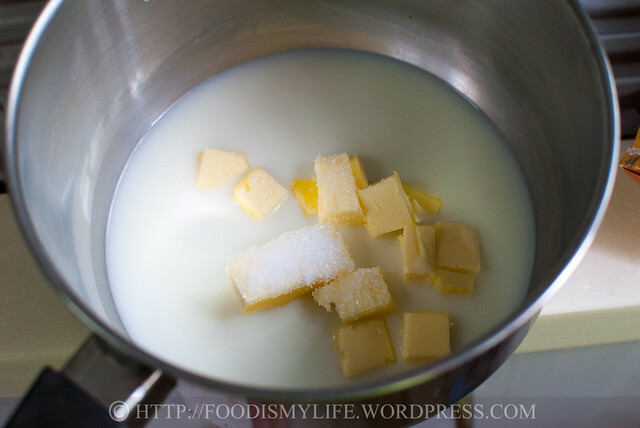 Combine milk, butter, sugar and salt in a pot. 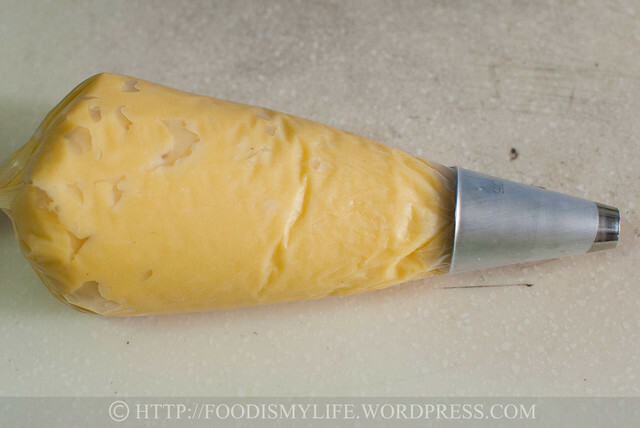 The butter is softened and chopped to little pieces so that it melts fast during heating. Heat the mixture over high heat, stirring occasionally with a wooden spoon, and bring it to a rolling boil - the mixture should be boiling and bubbling vigorously until the layer of butter is no longer floating on top. Working quickly, add in all the flour at once, turn off the heat and stir quickly with the wooden spoon to mix in all the flour. Once the flour has been mixed in, turn on the heat to medium-low and continue mixing with the wooden spoon (do not stop!) 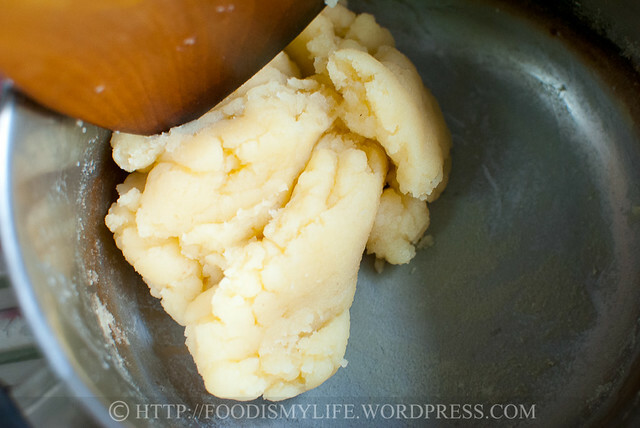 until the mixture forms a soft dough and that you can see a layer of dough at the bottom of the pot. Remove from heat and transfer the dough into a mixing bowl. Using an electric mixer, mix the dough on low speed for 5 seconds, then add in the beaten eggs, a little at a time (I estimated one tablespoon each time). Make sure the dough has fully absorbed the eggs before adding more. The dough will first seemed to separate but will come together eventually into a thick, smooth and piping consistency - and that's choux pastry! Transfer the choux into a piping bag fitted with a plain tip. Pipe small mounds of equal-sized choux onto the baking sheets, about 1 inch in diameter, leaving 2 inches of spacing between each choux. Once the puffs have cooled and ready to serve, pipe some pastry cream into the puffs and serve chilled, dusted with icing sugar. Store remaining filled puffs in the refrigerator for no more than 2 days as the skin will become soggy and soft. 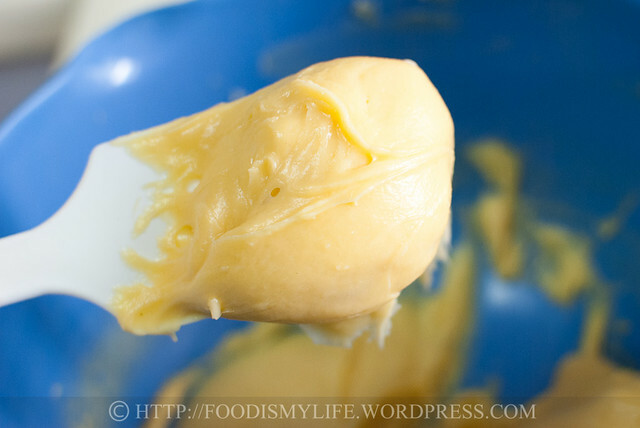 Make ahead (choux): After piping the choux pastry on the baking sheet, freeze the choux for 1 hours. Remove the choux from the baking sheet and wrap with 2 layers of cling film (plastic wrap). Keep them in a freeze-proof bag and keep them frozen for up to 2 months. When ready to bake, bake them (no need to defrost) at 200 degrees Celsius for 20 minutes then at 175 degrees Celsius for 30 – 35 minutes. Make ahead (unfilled puffs): Place the unfilled puffs in a single layer on a baking sheet. Freeze for 1 hour. Transfer the frozen puffs into a freeze-proof bag and keep them frozen for up to 2 months. When ready to use, remove the puffs from the freezer (no need to defrost) and pop into a preheat oven of 160 degrees Celsius for 5 to 10 minutes. Let cool and use as needed. Make ahead (filled puffs): Place the filled puffs in a single layer on a baking sheet. Freeze for 1 hour. Transfer the frozen puffs into a freeze-proof bag and keep them frozen for up to 1 month. When ready to serve, remove the puffs from the freezer the night before and let it defrost in the refrigerator overnight. If urgent, let the puffs defrost at room temperature for 20 minutes. (If you fill the puffs with ice cream, just serve them straight from the freezer.) The puffs will be softer as compared to freshly baked ones. You can substitute milk with water, but milk aids in the browning of the puffs – makes the puffs darker and more golden brown in colour. 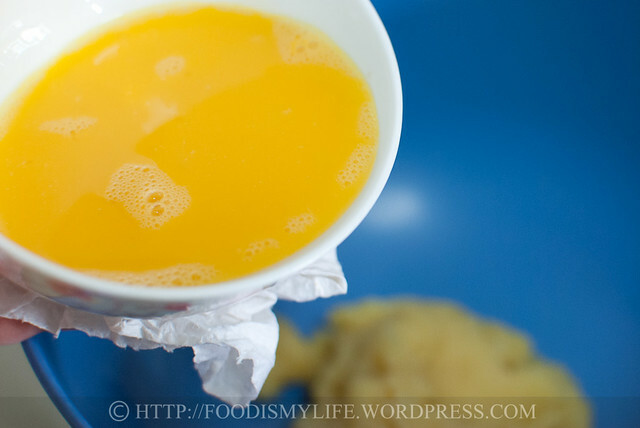 The milk mixture must be boiling vigorously such that the melted butter is no longer floating on top so that when the flour is added in, it’ll absorb the milk and not the oil. Sifting the flour onto the parchment paper makes it easier to add the flour in one go – you cannot add more flour after the first addition as it’ll become lumpy and the dough would be unusable. You can mix in the eggs by hand instead of using an electric mixer, but it’ll take a slightly longer time to be incorporated. You may not need to use all of the eggs, so it’s important to know the consistency of the dough and know when to stop adding eggs. The first bake at 200 degrees Celsius is to help the puffs rise rapidly to form an outer shell with a hollow interior. Once the outer shell has dried, it will rise no more, hence if you want even bigger puffs, spray the surface with a little water to give the puffs more rise. The second bake at 175 degrees Celsius is to allow the exterior to turn crisp and the interior to dry out. For a more classy finish, coat the top of the cream puffs with a little chocolate ganache, caramel or maybe some home-made butterscotch sauce! Do head over here for the YouTube video filmed by the author herself! 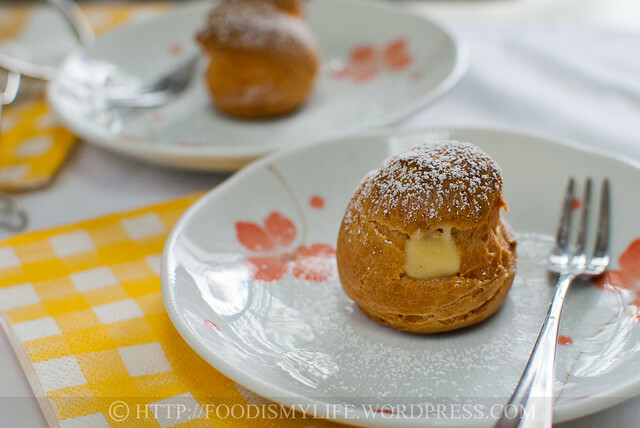 I glad to find a cream puff that uses a little less egg and even less butter successfully. Thank you! I hope you give this recipe a try and let me know how you find it! Thank you for the compliments Amrita! Aww thank you so much Lena! 🙂 I’m glad you guys decided on cream puffs as the theme! Totally agree with you John! Bliss on a plate, hell on the hips! Thank you Baby Sumo 🙂 Can’t wait to see your cream puffs! Yum! Thank you Amelia! Yea I can’t stop popping them into my mouth too, too addictive! Hi Zoe, thank you so much, you flatter me! Thank you for choosing cream puffs as the theme for this Bake Along, I learned so much through this bake and gained so much weight from eating all the cream puffs! Thank you Mich! It was really satisfying when watching the puffs “grow” in the oven! The only time I piped choux pastry was when I made the churros a while back that you commented on. Thank you! I think I’ll use the teaspoon method the next time when I’m lazy to pipe 😉 Thanks for the suggestion! wow, beautiful pictures. these look bakery-perfect!! What delicate and delicious looking puffs! Absolutely beautiful, who doesn’t love a cream puff!! 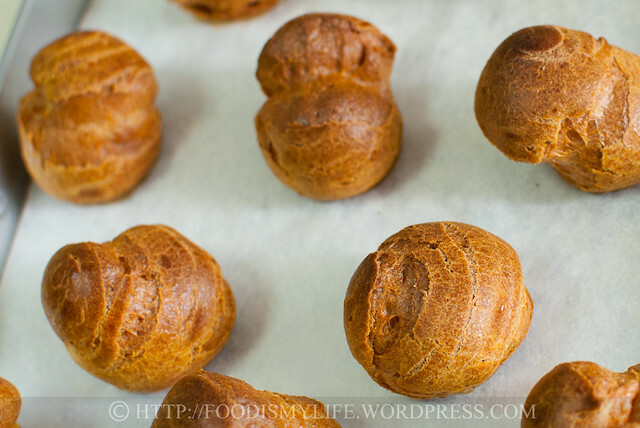 I have not made choux in a long time, now I’m inspired to do it! They look excellent! So pretty and professional! I would totally buy them (and eat them alone)!! these are gorgeous little puffs and as i mentioned earlier, your custard cream is really perfect! how i wish i cld really grab one and go! Oh, yeah! this is what I’m talking about! Bliss on a plate. 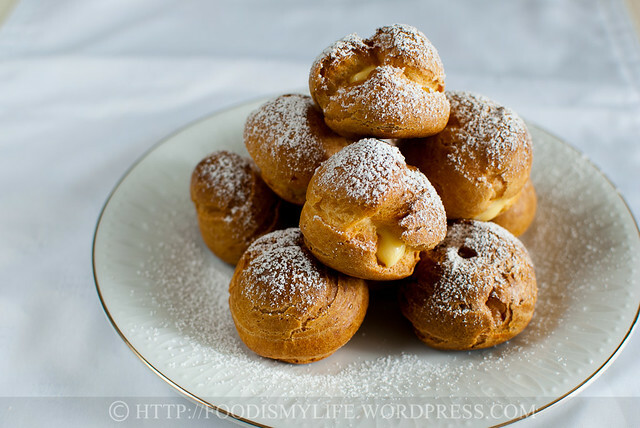 Beautiful cream puffs and gorgeous step by step photos, once again! I’ve always been too afraid to make profiteroles but you’ve inspired me to try. All these posts on profiteroles are making me so hungry! Jasline, yours look really great … I learnt this in a baking class, I shd try making this week too! 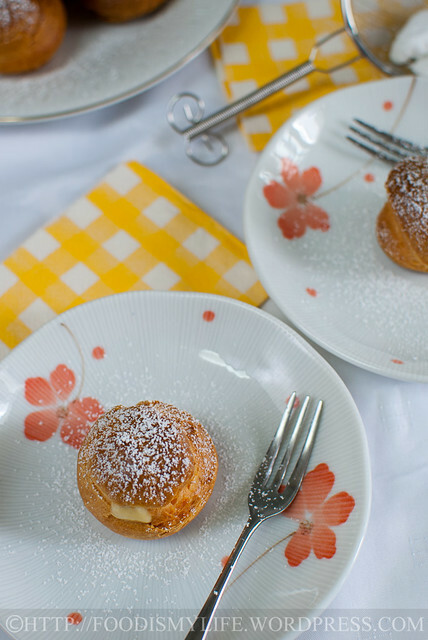 Your cream puffs are like a piece of art… Every step you did seems made these cream puff so perfect! Now, I know now that I have flatten the tip of the piped pastry to get your perfect round puff dome shape. Hi Jasline, your puffs have risen beautifully and looks so delicious.